I have not written a blog for a while; this was in part due to success from the last one which had some of the best feedback and an eagerness to update you all when the chaos ends. But when does it? I continue to get blood tests twice a week to monitor my liver enzymes (which have been raised) as the immunotherapy has likely caused a hepatitis (inflamed liver). This has meant and continues to warrant a large amount of immunosuppression with the steroids and mycophenolate. The latter is an immunosuppressant and used mainly in organ transplant rejection. The rationale behind this is to treat the autoimmune hepatitis. Due to the hepatitis, I’ve not been able to be given either of the drugs (Ipilimumab and Nivolumab) since the 11th of April, for fear they will exacerbate the immune response and completely smash my liver, which is also full of fat thanks to the steroids. Whether this brutal attack on my immune system is affecting my response to the melanoma remains to be seen. I’m much better than I was and the last two weekends I’ve managed to get to two brilliant stag do’s with help from my brothers. I’m now well in the process of trying to reduce my steroids and counter the muscle wastage. This is with a meat free diet, walking up stairs, cycling and latest a bit of swimming. All this with my new personal trainer Georgie (although she barely does any exercise herself!). This is all coming from using a stick just a few months ago. Wish me luck. For those who have been following me on social media will have noticed that I’ve won a lot of awards now. I personally thought the pinnacle of my achievement would be the FY2 Merit for Leadership I received from St. Helier Hospital which was presented last summer at a teaching session with my fellow colleagues. Maybe that was overly pessimistic. The recognition was nice but even then I thought it was uncalled for. Throughout this I just did what I thought was the right thing to do. The next award came again quite out of the blue. 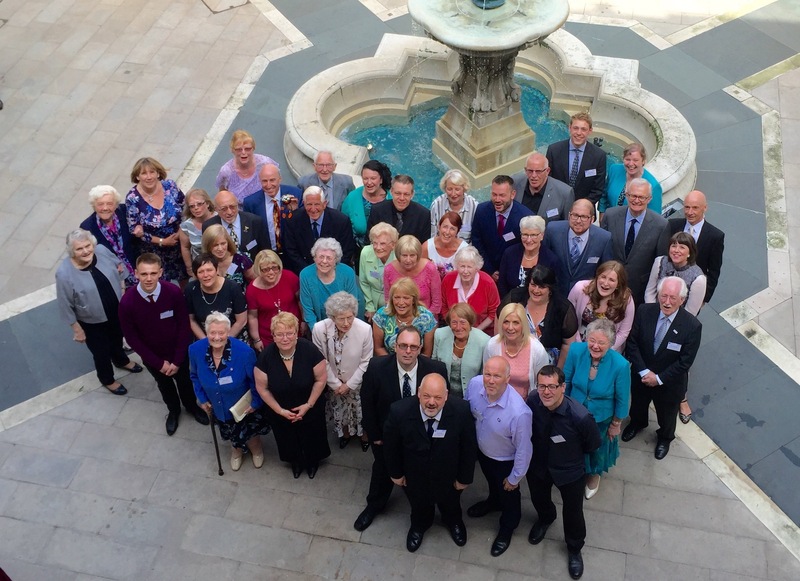 It was a vote on Twitter for the BMA top doc 2015 on social media. For two good reasons; I was unaware that this award existed and I didn’t use Twitter very much, which is the irony of winning the award and if you’ll remember I was an inpatient at the Marsden. Fortunately we strummed up enough support to win the vote. A theme formed; prize winning in hospital. My CV has boosted to new levels. Again I won an award that I’d never heard of, The University Of Leicester Outstanding Alumni Achievement Award. This I found out whilst sat in Georgie’s Northampton Hospital Accommodation. My nominee phoned me up to explain that I’d been nominated and would I be available to go to the award ceremony. He was under strict instructions not to say that I’d actually won but with a bit of pressing this was implied. This was again no mean feat and previous winners include the head of the cardiovascular unit in Leicester, a paralymic archer and the person who found Richard the 3rd. I couldn’t be there as I’d been admitted to hospital but I received the trophy later on from my hospital bed. Georgie and my family went to represent me and Dave delivered my speech. The latest award occurred on the 10th June. This time out of hospital. 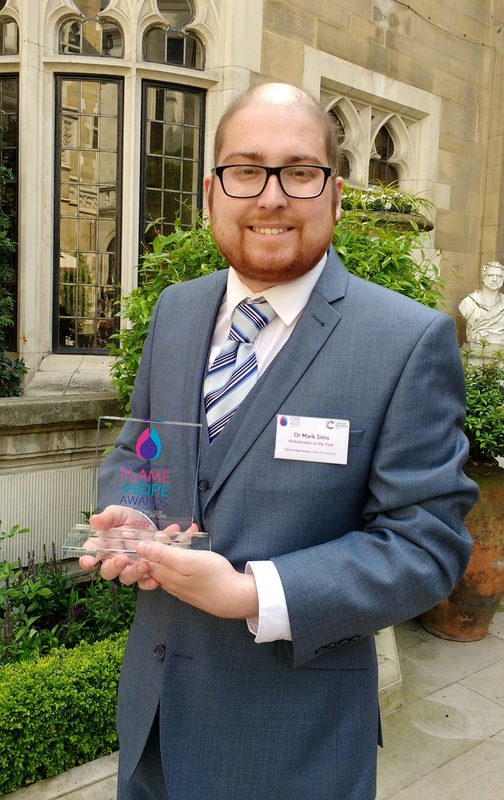 The Cancer Research UK Flame of Hope Awards. I was nominated by Lynn (my Cancer Research UK – CRUK contact) for the Ambassador of the Year Award, and what do you know, I won! Dave, Mum and Dad came with me to the event, disappointingly Georgie had uni that day. It was at ﻿Merchants Taylors Hall right in the city of London. An elegant venue dating back to 1347, and also an honourable one, as they were giving the whole day away for free. This was good quality meals for free. I was pleased my new found vegetarianism paid off and the food was exceptional. I went wearing a three piece suit. It felt very good wearing one, when you’re out of work and feeling ill, appearance isn’t always your priority. I was the only one there wearing his twin’s suit and the only one in a waistcoat, but for two very good reasons. The first because my suits no longer fit my CushingsMcCushingsFace frame and the waistcoat… because I’m a winner. The event was completely overwhelming and I’ll explain, it was such a big occasion. Firstly the chairman of CRUK came over to us whilst I was in the courtyard, we had a good chat, he’d given up his time to CRUK for 6 years to the cause and is stepping down from the role this year. Furthermore I was sat next to the CEO on the table plan. The CEO a Knight no less. Two of us on the table were award winners. The conversation flowed and I started with my story, which would be too self indulgent to repeat (even in a blog about the number of awards I’ve won). The other award winner Caroline Jones (@knickersmodelsown) was receiving Pioneer of the Year Award, she’d got involved with CRUK after her mother died of cancer. Her mother volunteered in a CRUK shop and Caroline decided to show the merits of second hand fashion by wearing a different outfit bought from CRUK shops every day for the whole of 2015, an idea she thought of on New Year’s Eve 2014. She kept a blog and this has been published in a book (please buy). All proceeds go to CRUK. Over the year she had a lot of media attention, went on the One Show and Loose Women. She raised a lot of money and increased the profile of CRUK shops throughout the country. Throughout, the only item that wasn’t second hand were her knickers, hence her Twitter account name. That’s just one story of many. All the winners are in the picture above. Minus three who have died, plus a few non attendees. For this reason it was actually hard not to cry throughout the award ceremony due to grief and the inspiring stories. The first story was of a teenager Charlotte Eades who kept a popular video blog of her experience of living with a brain tumour. She has now died at just 19, her parents collected the award on her behalf. The other stories I can recall, were of: a 97 year old who was still volunteering in a CRUK shop, she looked 80 by the way; a lady, who over the years has raised a million pounds; the Young Fundraiser of the Year, who raised £100,000; a guy who’d been running the great Christmas pudding race for years; a 93 year old who raises £1000 a year from her knitted tea cosies; and lastly the joint Ambassador of the Year Award (with myself), a breast cancer patient, Alex King who literally bared all for world cancer day. Apart from being there to bring down the average age of prize winners, why did I win? I guess it’s due to how powerful the narrative has been. It is a story of survival, love and a desperate desire to beat cancer sooner and raise awareness. Being a doctor and knowledgeable has helped, plus the ruthlessness and honesty of the blog. Lastly everyone likes a love story (it’s even better being part of one). However, I could’ve been more ruthless, cancer is terrible. Due to all these reasons, the story was as many of you know, widely shared. It’s been in over 100 local newspapers and local news channels here, as well as publications in Dubai and Australia. The justgiving page has funded equivalent to three PhDs. But most of all my story is a recognition of the coming of age of targeted cancer therapies and immunotherapy. But to labour a point, one we need to fund because they work! The overall consensus from all the winners is none of us did what we did for any recognition. From the stories it was clear most of the winners would never have got involved if they weren’t personally affected by cancer, be that themselves or a loved one. They did what they did and continue to do what they do to make it better for the next generation of patients and achieve the goal to Beat Cancer Sooner. But well it’s been nice winning awards. Dave joked to me during the day that you’ll only know you’ve done well when you’ve got an award named after you. He’d forgotten that my old supervisor had arranged this, and the “Mark Sims Prize for Laboratory Excellence” will be presented soon. It’ll be given to a medical student who has shown great competence and dedication during their laboratory year while studying for an intercalated BSc. It doesn’t end there. Next month I’ll be receiving a British Citizen Award, a prize started in 2015 as a way of recognising outstanding achievement in the community. Mum nominated me for it after seeing an advert on the internet. Hopefully I’ll be able to receive my medal at Westminster Palace no less, followed by a certificate. I’ll also be able to name myself Dr Mark Sims MBChB BSc BCA. Simply unbelievable, you’re so inspirational mark, I’m still reading every one of your blogs, and looking forward to hopefully meeting up with you Tim and Georgie one day. Keep going, you are a genuine hero- and there aren’t many of those around. Hi thanks for your comment Sarah, but who’s Tim? I have been following your blog since the beginning, as was told your story by Saskia who is a great friend of mine. Your blogs are always so beautifully written and it is good to be kept up to date. My sister blogged her way through Leukaemia and it was hard when she didn’t do it for a while as everyone would ring and ask if she is ok, I am sure your family find this. Sadly she died 18 months ago. I wish you all the best and u am praying for you and your family. Thanks for your comment, the support I get continues to overwhelm me and keeps me going. You win at life Dr mark, if I was in your shoes I would probably be a defeatist, throw my hands up in the air and just give up. That’s because I’m a loser. You’ve managed to bring attention to the plight of melanoma sufferers, raise money, fall in love, inspire and you haven’t lost yourself in the process, your fighting spirit and looking ahead attitude is maintained in the face of all new challenges and setbacks. You are a winner. Hi, I’m not sure who you are because it’s come up as anonymous but thanks for your comments. Thanks it was a very lovely day. What amazing achievements. So humbly borne. You are a phenomenal human being. May you continue to be an inspiration. I use your story as often as I can at Cabot. Much love to you, Georgie and family. Hi, I hope you’re well, lot has happened since my visit to Cabot last year! Thanks for spreading the story with the students I hope they’ve been inspired. If anyone’s thinking of applying for medicine and they’d like some advice let me know.